Paws & Play Dog Resort & Training Center's resort style boarding and lodging provides a relaxing experience for any dog in Indianapolis IN. All of our rooms feature glass front doors so your dog won't miss out on any of the action. Our upgraded rooms also feature Kuranda suite bedding. You are more than welcome to bring any belongings from home to help make your dog's stay even more enjoyable. We provide premium, human-grade Acana dog food fresh from our Cantina for your convenience. If you would prefer your dog to stay on their own diet, please feel free to bring their own food. Includes 4 potty breaks, daily wellness checks, room service, and music. Includes 1/2 day of Day Care, 5 potty breaks, Kuranda suite bedding, community cable TV, daily wellness checks, room service, and music. Includes full day of Day Care, Interactive Toy, 5 potty breaks, Kuranda suite bedding, cable TV, daily wellness checks, room service, and music. A one-of-a-kind room with a one-of-a-kind experience. Includes full day of Day Care, Interactive Toy, Ice Cream Treat, Leash Walk, 5 potty breaks, Kuranda suite bedding, cable TV, daily wellness checks, room service, and music. Paws & Play offers more than 10,000 square feet of indoor and outdoor play space! Our outdoor play areas are equipped with XGrass Canine Turf, a turf made specifically for dogs. Our guests are able to enjoy the comfort and familiarity of grass without the mess. We also offer doggie pools for those water loving guests. We believe that a social and active dog is a happy and healthy dog. Our Group Play Day Care guests are separated into playgroups by size, age, and temperament. 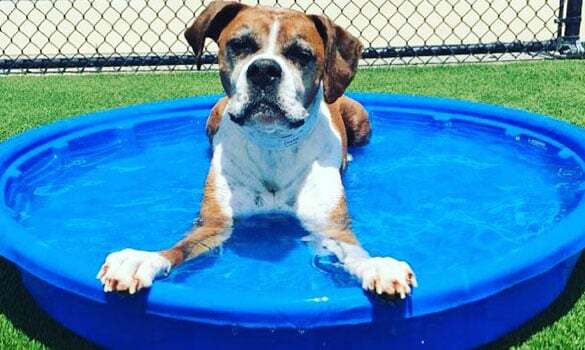 They play with their friends, toys, and doggie pools while enjoying nap breaks throughout. This ensures that your dog is playing happily and safely. A day of relaxation, toys, and walks. Each dog will enjoy relaxing time in their own room complete with music, bedding, and an interactive toy. Potty breaks are provided throughout the day along with a mid-day leash walk to sniff, play, and snuggle. A day of play, training, and walks. This Day Care program starts with a morning warm up consisting of leash/treadmill walks and rest times. Mid-day entails multiple sessions of one-on-one play or snuggle time and a session of a fun activity. Activities will range from learning new tricks to puzzle games to agility equipment. The late afternoon will be a cool down period with controlled activities like leash walks and massages. It is a fantastic place that all three of our dogs love. We really do not know what we would do without P&P.